Over the past few years, my grandmother has steadily declined into dementia. Although she is still with us in body, she is no longer with us mentally. The grief I feel over losing her began with those first episodes of her mental decline and continues to plague me in different ways as the disease takes hold in more destructive ways. A holiday visit later that year confirmed grandmother's dementia was progressing. She had begun to regress into a childlike state. She was unable to wait for the family to leave for a restaurant, but began taking cookies from a cookie jar. While the family chatted before heading out to a restaurant, she continued to interject “When are we going to eat?” When my mother arrived, she said to her, “You’re so fat.” When my mother poured glasses of wine, she asked for one even though she had not drank wine for over 20 years. (Once she got the glass of wine, she clearly did not want it, she just didn’t remember she didn’t drink it any longer.) When I returned an uneaten serving of chips into their original bag, she copied me and began returning her uneaten portion of chips back into the bag as well. Just three months after that visit, when her health took a sharp downhill turn, she was no longer caring for herself as she once did. The woman who refused to leave the house before reapplying lipstick and some perfume, the woman who had her hair styled once a week and got manicures every other week, now had not only begun neglecting her appearance, but also stopped showering altogether. Together my mother and I had to help her to wash and dress herself. The woman who cared for mom, and then me, the woman who helped raise me when I was young, now required our care as the “adults”. Around that same time, she had begun requiring the use of diapers during the night. She could no longer awaken in time to use the restroom in the bathroom at night. Even now as she is in a good senior care facility, she continues to say its too much trouble to shower. She also continues to refuse to have her hair styled or cut, although she did agree to let the manicurist paint her nails “Munsters” green (a color my grandmother chose). A conservative woman, I only ever saw her wear various shades of pink on her nails. I would have found it amusing if it weren’t so damn depressing. When we went through my grandparent’s house to sort items out once she was moved to the senior care facility, I found that personal hygiene items I had been sending her as gifts over the last few years (perfumes, cosmetics, skin and hand care gift sets), sat either barely used, or completely unopened. It saddened me to see the items I knew she would have enjoyed in earlier years, the things I handpicked to gift her, weren’t even valuable enough to take with her when she left her home. I grieve the loss of the opportunities I will never have again because my grandmother’s dementia has changed her from the functioning person she once was. I will never learn how to make her buttermilk pancakes from scratch nor her baked chicken or many of her Midwest styled recipes she knew by heart. I will never get to learn more about her family history. I will never again have the opportunity to shop with her to pick out things, from the most special (my wedding gown) to the least important (a bed comforter). Knowing these things will not happen again has led me to hold onto her old cookbooks and the last items we shopped together for, back when she was still herself. I am angry with myself for not making the most of those opportunities when I had them. I’m angry for not learning how to cook the dishes she excelled at. I’m angry for not writing more family stories down, and for those I did record, for losing them. I am remorseful for the one time I refused to eat the birthday cake she baked me because I was being an obstinate teenager, refusing to cheat on my low-fat diet. I cannot change any of these things, and that saddens me greatly. In many ways, the loss of opportunities is what saddens me most of all. My grandmother is still here, and could potentially have still contributed to sharing her knowledge and experience with me if she hadn’t had dementia. No one sees these things coming. We see the life expectancies lengthening, and devoid of any serious illness, we think our loved ones are going to be here for years to come. Perhaps this is denial. Nevertheless, with that mindset we never get to make the most of each and every moment. I wish I had. These days, I fear visiting my grandmother for I am afraid of how much worse she will have become. On a visit in September last year, I was shocked to find she no longer knew who my husband was, even though she was my one and only matron of honor in my wedding just a few years earlier. (I had no bridesmaids or maids of honor, just her.) On my father’s visit a few months earlier, she was able to connect the fact that he looked like someone she'd known, but she didn’t realize it was indeed him. Although she did recognize me on my visit, I could not truly have a conversation with her because she says very little, smiles and every few minutes pats her hand on the table or taps fingers on the table. During our luncheon at her senior care home, she said she wasn’t hungry, then proceeded to take French fries off my plate. She ordered a slice of blueberry pie and when my husband’s apple pie arrived, she wanted that instead. Throughout our visit she continually asked who my husband was. What I have found interesting in this experience of grief is how it continually keeps changing. Each time I adapt to one loss, I face an entirely new one. I have adapted and adjusted through the grief of accepting the littlest things lost (my forgotten birthday, her no longer cooking or shopping), to the grief of seeing her own care of herself and the ability to function decline. I’ve adapted to the grief of seeing her forget people in the family, to the grief of finally accepting that the opportunities I’ve lost with her are gone and will never reoccur. My grief continues to change and evolve as I see her dementia slowly taking hold in more destructive ways. I grieve the loss of her memory as it continues to fade away and I grieve the loss of my grandmother as the person she once was. Inspirational American fitness, exercise and nutritional expert, Jack LaLanne, has died at age 96, from respiratory failure due to pneumonia. 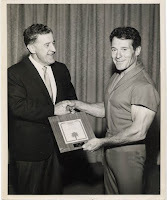 His many achievements included a chain of health clubs he licensed to Bally Company (they are now knowns as Bally's Total Fitness), "The Jack LaLanne Show," a television exercise show that ran for 34 years, and several books and videos on fitness, as well as exercise equipment, vitamin supplements & juicers. He worked out 2 hours each day throughout his life. He was laid to rest February 1 at Forest Lawn.